Definitely, YES! 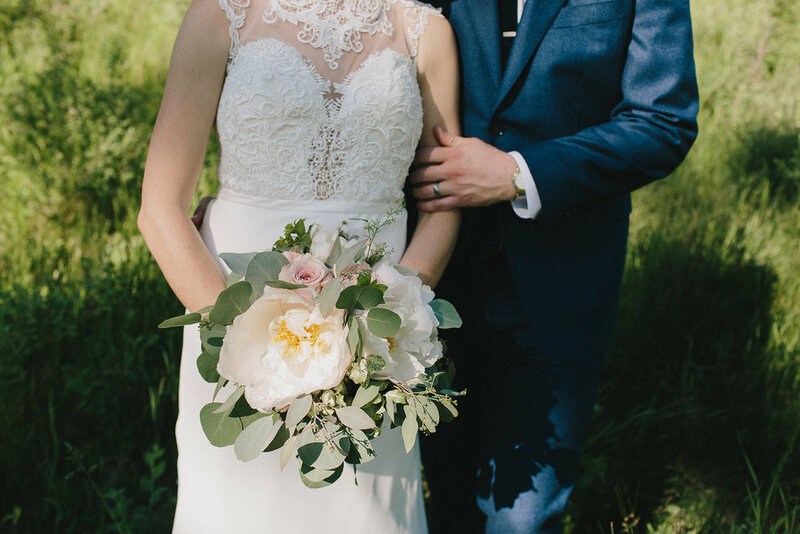 Whether it’s supporting a Canadian maker, utilizing eco fabrics or re-using a previously worn gown, there is an ethical wedding dress for you! Katherine’s custom-made dresses are hand crafted in Nova Scotia from new and vintage fabrics. An advocate for the slow fashion movement, Katherine gives beautiful vintage fabrics new life through incorporating them into her designs. When raw materials are bought from abroad, she ensures they come from fair trade sources. Mikaella Bridal has been a family owned and operated company in Toronto since 1937. To this day their dresses are 100% Canadian made and can be found in over 200 retailers around the world. Pure Magonlia’s customizable dresses are handmade in North Vancouver from vintage and recycled fabrics, silks and organic cottons. For Vancouver-based brides they also remake vintage heirloom dresses. You can find their dresses for sale in British Columbia, Ottawa and select cities in the US. Truvelle’s made to order dresses are minimalist and elegant. An intriguing option for a bride who is looking for a dress she can wear again after her wedding. Design, production and administration all take place in their Vancouver studio. Read our "Why Shop Local?" post to find out more about why supporting makers in your community is so dang great. Ceila Grace dresses use eco fabrics and natural dyes, produce in fair trade factories and donate a school uniform to a child in Cambodia for every dress sold. Their 2017 collection was specifically designed with convertible styles to make their dresses lifelong wardrobe items. They also support brides in donating or up-cycling their wedding gowns after the wedding. Christy Dawn designs specialize in using deadstock fabrics. These are fabrics leftover from larger fashion houses who overestimated their needs. Christy Dawn rescues these fabrics that are headed to the landfill. The dresses are handmade by talented seamstresses in LA. Deborah is known as a Green Queen in LA for her use of eco fabrics including vintage cashmere, hemp blends and organic linen. The blend of sustainable and upcycled fabrics make for a bespoke collection of earth friendly wedding gowns. LA-based Reformation is on a mission to lead and inspire in sustainable fashion. Their responsibly manufactured dresses are simple, graceful and easily re-wearable after the wedding. Based in New York, the Cotton Bride is a line of dresses created specifically for the “discerning bride”. Their airy dresses are made from 100% natural fibres including cotton, linen and silk. The previously mentioned Canadian designers Katherine Feiel and Pure Magnolia are also eco friendly options. Carrying both once worn and consigned new dresses in great condition, the Bragging Bride is a must go for a bride looking for a budget friendly and gorgeous wedding dress. This small boutique offers private appointments where you receive the full attention of the ladies running the shop. Shop a consigned collection of beautiful new and used dresses at 25%-75% off their original price. Private appointments allow the shop to focus 100% on the bride. Antiquaire offers beautiful vintage dresses spanning almost 10 decades. An affordable, eco-friendly and unique option for your ethical wedding dress! Shop gently used wedding dresses across Canada, or the world! We know a couple of brides who have found their perfect dress on Kijiji! Kijiji can also be used to find things like decor, bridal accessories, bridesmaid dresses and other wedding-related items. Still on the hunt for a designer to bring your custom dress to life? Aileen Twa Design in Vancouver specializes in custom wedding dresses for women who are conscious consumers. Most importantly, enjoy the process! If you find a dress that honours your "ethical lifestyle" values, great! If you are finding that the ethical dress options are just not working for your budget, your body, your timeframe, etc. and it's really freakin' stressin' you out, then ease up on yourself! This article by Dignify has helped remind us that perfection isn't going to happen, and that's ok. We can still congratulate ourselves for the ways we have successfully incorporated ethical shopping into our lives, and should be gentle with ourselves when this doesn't always work out. "The 80/20 goal: If you are succeeding in being mindful about your life and choices 80% of the time, you are doing great! Celebrate! Don’t worry too much about the other 20%." Conscious brides, ethical event planners, thoughtful shoppers, zero wasters, read this: My Failures at Perfection and Why I Focus on the 80, not the 20.